BTS - Bangtan Boys in Montreal or Quebec City? Inform me about the next events for BTS - Bangtan Boys. Enroll yourself to our priority waiting list for BTS - Bangtan Boys to be alerted when new tickets are available. Filling this form doesn't engage you to any purchase. 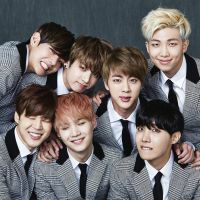 BTS - Bangtan Boys doesn't have a show schedule in Montreal yet... but 2018 might be the year when the famous Korean boys band finally visits Quebec ! Formed in 2013, Bangtan Boys has generated over 4 billion views of the videos on YouTube, and sold over 1,2 million copies of their 5th EP, Love Yourself, in less than a year ! The K-Pop phenomenon is conquering the world, having sold out shows in the USA. Will BTS - Bangtan Boys finally come to Montreal in 2018 ? Stay tuned to find out !